Does passion mean there is meaning? Just do it. This cliché admonishes. Don’t lose the spark, it says, as we go about our day. Don’t have a life without value. Work hard – hardly working. (A favorite of mine) When we buy an iPhone, enter a mall, join our friends for dinner, graduate or enter the workforce – they surround us. Carpe diem. Life is a book, and if you don’t step outside your door, you only read one page, says Pinterest. Okay, okay. These are kitschy epithets designed to fuel passion but is that the only task they accomplish? Is doing what you love choosing not to value real work? On the surface, DWYL is attractive. After all, the research I am doing in the middle of the Monsoon-influenced tropics is unstable and unpredictable. This makes it exciting. It is hardly what Tokumitsu might term “unlovable” work. It might be hard at times adjusting, but it is far from what might be called hated. So what is the problem with this? Well for one, if I believe what I do is ‘great work,’ then is it so? Someone should have a problem with this. There is no accountability. There may not even be actual work, from a labor perspective. As the writer suggests of DWYL versus the old motivation for labor – to work hard- there is a distinction now between internal and external factors. “By contrast, the 21st-century Jobsian view asks us to turn inward. It absolves us of any obligation to, or acknowledgment of, the wider world.” she states. So, does one work for personal reasons or to produce something, make something, or create something? Is a ‘trendy’ job as a designer or a ‘lovable’ job as an artist only measured by your enjoyment of it? While Tokumitsu is saying something quite fascinating here, I have observed that there are quite a few differentials outside of this dichotomy. Is there not a place in between these two ‘opposing classes’? Surely, there is an element of the unknown for people who have passion for chosen careers but are unable to simply place it in a ‘lovable’ category since it is still plain, hard work. ‘Lovable’ implies artist, actress, designer – or maybe ‘prestigious’ as in doctor, lawyer, even banker (hardly ‘lovable’ really). As Jacobin asks: what about the worker who must work simply to put in hours, bring home income, and/or support a family – the domestic servant, restaurant waiter, strawberry picker, janitor? Have we left out the importance of labor in labor itself? Has this been replaced with the meaning of DWYL passion? Then there is the profession of the unlovable but “socially necessary” work that Tokomitsu tackles, which I think definitively exists in the engineer, the social worker, the scientist, the paralegal, and the nurse. These are well-chosen, educated positions which are needed for a humane society but are not celebrated; not necessarily even part of dream careers. Loved and unloved jobs are not created equal. Think of the construction worker who enjoys his work building but puts in six to seven days of hard labor erecting and creating – some days he truly enjoys the work and other days he wonders why he signed up for such an experience. It’s exhausting. It is certainly not a prestigious line of work in the privileged eyes of elite society, but it is intellectual work at the management level, and it confronts issues of design, spatial limitations, and balances the work of artisans and producers alike to create something. Why is it not taken seriously by lawyers, doctors, and others in the so-called prestigious lines of work? Perhaps it isn’t because it does not easily fall into the categories of the aforementioned ‘lovable’ and ‘un-lovable.’ Do What You Love is more about doing something for oneself than actually producing something. So perhaps there are more questions. Granted, it raises some interesting ones already. Why is it that diplomats, astronauts and Emergency room M.D.s are more valued than the bartender at the local hotel? Why are we re-creating the social classes the 21st century is meant to be eliding in the modern world? Why does labor value passion over labor itself? Does passionate work even mean there is meaning in the work? Or do we just look good doing it? Of course there is the obvious answer to the first question. High powered attorneys are glamorous. Models are hot. However, we may be ignoring a problem that the DWYL cliché creates: where is the value of actualized labor? If we can answer this, we may be able to consider the others even more carefully. While there used to be a sense that work provided for the ‘having it all,’ now the DWYL initiates a belief that work should be more about us than about…well, work. That should at least get us to start thinking. Nice writing 🙂 I think a lot of DWYL can be influenced by the conceptualization of your own identity. 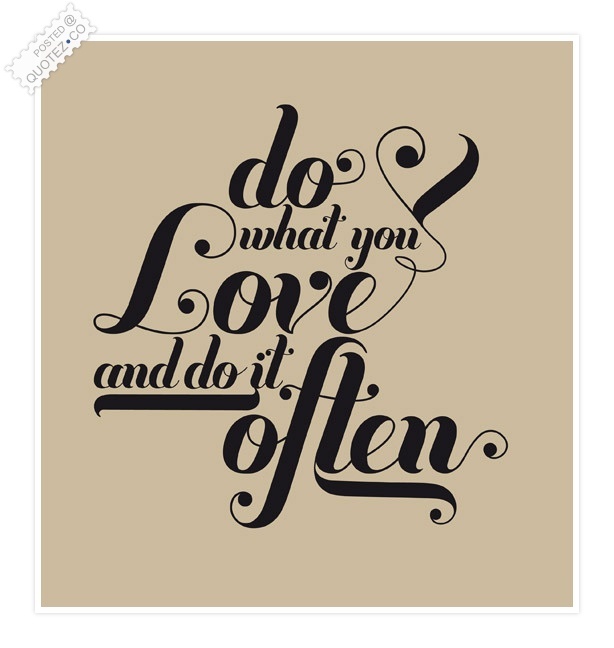 Do you do what you love, for just you? Do you do it because you identify yourself as a family? As a community? As a country? As a global unity? . . . While we may not be able to detect the immediate satisfaction of DWYL when we identify with a larger whole . . . the satisfaction can come from an inner desire to be of service to a grander whole, for that is in fact a service to oneself, as ourselves is in fact that whole. What you “love” could also be the satisfaction that comes with effort. Happiness from DWYL can feel hollow without the effort. and sometimes the satisfaction from pure effort can be exactly what you love . . . especially when your happiness is derived from appreciation of what you already have, instead of getting what you didn’t already have. . .
Now i’m just rambling . . . .hehe, but it seems the DWYL generation has come out of a large amount of research that focused on productivity and success with it’s relatedness to how much you “enjoy” your work . . . with a bit too much emphasis on joy . . . which to the gen Yers, and the “present moment” aficionados, means instant gratification in the present moment that can be felt emotionally and sensationally . . .
Michael, I think you’ve mentioned a good point here that I was trying to assert – that the ‘instant gratification in the present moment’ is largely the motivation for many. It seems that while doing what you love can produce more than just something for oneself, the egoist motive might be larger-than-life as opposed to other goods, you’ve mentioned here, like identity as a community, global unity, and the last one you said: the ‘service’. Service is something the average worker doesn’t necessarily mediate on in the modern world and there is VALUE in this – for yourself as you state well, for you, but also the YOU as a member of the grander community. Also, what happened to simply wanting to give in service (without any direct benefit on oneself). Honor is not an antiquated concept. Another thing I did not really touch on but it is relevant: how the bottom line comes into play. Tokumitsu doesn’t spend too much on this but it is worth stating that too many measure the prestige by how much fiscal or material cost a job is valued at. Regardless, our worth is more than just our monetary consequence. Rather than state that “if profit doesn’t happen to follow, presumably it is because the worker’s passion and determination were insufficient,” but that this should not stop DWYL workers. They are, after all, in it for themselves and for ‘love.’ Profit still contributes to GDP, to a national economy and globalized trade/commerce. A consideration? I don’t think that the “do what you love” mantra necessarily devalues or dehumanizes labor. As you wisely point out, there are all sorts of undervalued, underpaid, unglamorous jobs out there that must be very rewarding to the right people (the people that love to do those things – i.e.take care of the elderly, fix cars, build things with their hands). Tokumitsu’s declaration that creative, intellectual, or prestigious fields are the only possibly lines of work where individuals can love what they do is what is truly elitist. Tokumitsu also presupposes that labors of love are without actual labor. A lot of people struggle day in and day out doing what they love- even in some of those prestigious or cool areas of work. I knew a fairly successful painter in Japan who worked so hard at her craft and spent ridiculous amounts of time in the studio hunched or contorted over a large canvas, eyes straining in focus, hand clutching a brush making detailed, yet repetitive brushstrokes, working to the point of exhaustion, physically and creatively, that she actually burst a blood vessel in her eye just before her exhibition opening. To say her work isn’t laborious, is absurd. To say that because it is hard and painful, that she doesn’t love what she does, is to completely miss the point. This is essentially how I understand the mantra, that if you do what you love, you are actually willing to work harder, and yes, in the wrong context that can be exploited. For me this also translates into personal responsibility rather than a lack of accountability. If people dedicate themselves to their work and strive to do “great work” as Jobs says, they must first pass the test of their own judgement before getting approval from another. I have certainly been guilty of creating work well below my own standards that has nevertheless received praise from others. On the flip side, I’ve also done work that at the time I thought was top-notch before somebody pointed out just how terrible it truly was. Of course, the answer lies in the balance between responsibility and accountability, but the first step towards producing higher quality work in any field starts with the person actually doing it. ” the first step towards producing higher quality work in any field starts with the person actually doing it.” I like that you’ve shown the labor as part of the art, as in the example of the painter. But I don’t agree that it is a just somewhere in the middle between responsible and accountable. 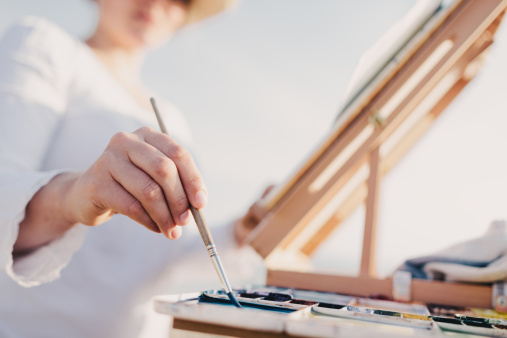 While responsibility is important, as you state here, someone must always look at the results – which must be measured outside by the external factors, like other painters, visual artists, and arguably who buys the art. Think of how much “contemporary art” is produced because it the trendy thing but it is just crap. Should we care? I just had a very calm conversation this morning over coffee with a colleague who said that while approaching things in the scientific method (this was not a subtle way of pointing out how I do so) is helpful, he found that most people would rather live in the moment. This includes some of what you’ve said here: “Whatever I can to survive.” I don’t think it is even a conscious decision for some; just that it is easier NOT to THINK. While I think corporations should take responsibility, especially those who have a monopoly on markets, such as Apple, Coca-Cola, Nike, the only way to truly make change is for people as individuals TO THINK. These people, in turn, can use their education, awareness, whether they are managers at former said corporations, lemmings who jump off the cliff diving for the next iPhone upgrade (Really?!) or socially aware individuals who want to understand their world, their choices. As a community and as individuals we are ethically responsible for our choices. Corporations are also helmed by human beings (despite the fact that it does not always seem the case) – they all need to step up but when it comes to the drive for profit, the bottom line, and the love of money… there will always be greed involved. Perhaps a tragic picture but that’s the truth from what I see. I went to a great lecture once entitled “Do bad things happen because of bad people?” It was about the pharmaceutical industry (one of my pet hates, I’ll admit) given by a biochemist with a military background. His central point was that in large organisations, most often it’s PROCESS and SYSTEMS that determine the outcome from a particular set of variables, rather than the actions of any particular individual. These processes and systems are, of course, designed and implemented by individuals, who certainly do have, as you say, a choice an ethical responsibility, but they are already working within larger systems and processes that limit THEIR actions. If we look at the actual power of Manager A, CEO B or even President C (think of Obama’s current situation, whatever you may think of his policies), their individual power to change ANYTHING is very limited. I think the systems have grown out of control. An individual can, of course, vote with their feet, leave their job (if they are truly stifled, or forced into actions that are morally unjustified) but then processes exist to replace that individual with another, more compliant one and, because of the ‘need’ the system itself has created for high value consumer goods, political power and so on, there will always be another shmuck waiting in the wings. Imagine a world in which consciousness, human nature if you will, were more completely understood. Imagine if, instead of simply descibing the preference that people have for ‘living in the moment’ we were able to explain it and, what’s more, to explain it in the context of evidence that, when pushed far enough, people WILL change, WILL rise up, WILL accept responsibility for their actions. If we had a more complete and widespread understanding of WHAT we are, including our absolute dependence on each other, and on the planet, the necessary change would, I believe, begin to happen, as if organically, within the systems and processes that we have made. Only the scientific method can provide us with evidence robust enough to drive this change. “…lemmings who jump off the cliff diving for the next iPhone upgrade…” = the majority of friends I still keep in touch with from high school. They countdown the hours until they get to go home, and basically just live for the weekend. They simply don’t want to be challenged in any capacity, don’t care what their contribution to society is (if there even is one), and they’re OK with it. They want the pay check so they can go out and buy the car, the clothes, the house, etc. Their job is just a means to survive. Their job isn’t a conceptualization of their identity in any way, shape, or form. In fact, I’ve asked many of them, “What do/would you love to do?” They can’t answer. They’ll never be one of those DWYL people because they don’t even know what they love. It’s like what you just said, that these people would rather NOT think. It is indeed easier not to think. Quite honestly, these types fascinate me. You touched on something I struggled with for a long time – Prestige. When I entered grad school I had this grand vision of myself becoming a professor… doing important research and perhaps consulting with policy makers. I knew all along it’s not what I wanted. But I worked hard for my degree and produced stellar work. My profs said, “You write well and could be a valuable contributor; therefore, you ought to pursue a career in academia.” So I listened. And then, dropped out. Now I teach kindergarten kids phonics and basically how to behave/function. I avoided admitting to myself that I always wanted to be a teacher because it wasn’t “prestigious” enough. And many of my former grad school friends that are in the process of getting their PhDs would probably say so, too. I placed “elementary teacher” in the same category I’d placed “construction worker” or “waitress” – the “nothing special about that job” category. I had that elitist mindset for so long. That’s why it took me until the age of 28 to finally admit what I knew all along – I’m a teacher. Even though I love what I do and I’m an advocate for DWYL, it can’t just be about me. If there was proof that I was an ineffective teacher, I’d either seek some serious training or consider a different career entirely. There needs to be a valuable production of some kind that benefits the larger community. In this case, producing young critical thinkers. I like what Michael stated above: DWYL isn’t necessarily all about you. It depends on how you identify yourself – as an island (then, ok it is all about you and probably the attainment of “instant gratification”), or as part of your immediate/global community, etc. Basically, I could just copy and paste what Michael said because it’s exactly how I feel about this issue. But that would be redundant. Ah, Lisa. I really enjoyed your comments. Yes it certainly is easier not to think, and all of us do it at one point or another. No one can be ‘on’ all the time, can they? So for those who choose to stay at home, make just enough, buy another car, their first house, etc. – we certainly cannot change them as they are a part of our environment. However we can definitely live lives that have meaning and ‘give’ as you do, as an excellent kindergarten teacher I’m sure. You might not be aware but I’m sure your life itself is an example to those non-thinking friends. I’ll bet they are watching you and are more influenced in positive, heart-wrenching ways than you can imagine. Just wait a few years – we’re all growing. Looking forward to more comments from both you and Chris Crenshaw in the future. Rock on people.